At first glance you may just take as just another phone. However, the UMIDIGI A3 is no ordinary smartphone. It packs triple slots, dual 4G VoLTE and global bands. With all these UMIDIGI is definitely not compromising when it comes to the SIM slot design for this entry-level phone. Maybe that’s a future trade for a budget phone. But the time when it comes out to the market, it definitely will become an entry-level beast. Nowadays, there are a bunch of budget phones with a 16GB built-in storage in the mobile phone market, many of them only provide such solution: you can use either two SIM cards or a SIM card and microSD card in the second SIM slot in your phone. So on paper, the phone manufacturer would say that the phone storage capacity is expandable. But for that, you have to use your SIM slot, which means now your phone is a single SIM phone. Especially, for entry-level budget smartphones, which usually has a small inner storage and users have to sacrifice the second SIM slot to expand the storage and there is always a compromise. But today things seem to have changed with the UMIDIGI A3. Just a few days ago the growing Chinese mobile manufacturer UMIDIGI leaked a UMIDIGI A3 series with a popular design. 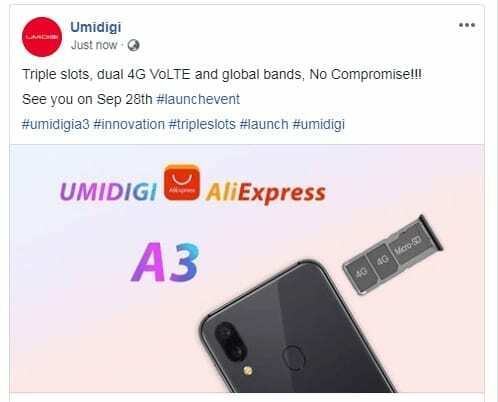 And today UMIDIGI on their facebook indicated triple slots design for the coming-up A3. So what exactly is triple slots? If you are thinking triple SIM slot, you are definitely wrong. It Actually means that apart from the dual SIM slot there is a dedicated MicroSD Slot, so there is no compromise anymore for a budget phone with a small built-in storage. Also, Dual 4G VoLTE and global bands support were also mentioned in the post. So it is an international phone and will be great company for a global travel. SIM slot design is an important thing even for big mobile manufacturer Apple. In order to satisfy users request, Chinese version iPhone XR and iPhone XS Max support Dual Sim tray. Apple for the first time changed the design for SIM slot since 2007. And we are pretty excited about the innovation in this field that UMIDIGI made for themselves. We probably are expecting an entry-level beast from UMIDIGI. What do you think about the upcoming UMIDIGI A3 with triple slots and global bands? It is really a budget beast in the mobile market? What kinds of features do you expect for it? UMIDIGI A3 will launch on September 28th. Stay tuned for more interest news. Check more info about UMIDIGI A3 right here at UMIDIGI Official store on AliExpress.